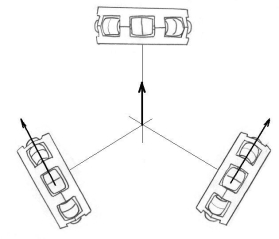 To ensure even portion weights when radialy cutting products, it is essential that the centre of gravity of an object is aligned with the cutting axis. The centraliser locates an object’s centre of gravity and can then align it as appropriate. It is designed to improve cutting accuracy to existing radial portioning units. Key to the centraliser are ‘omni wheels’ which look like normal wheels but have freely rotating barrels mounted around their edges so that they will skid sideways. By using three such wheels in a triangle and calculating their movement using a mathematical procedure called holonomic motion control, a product resting on the three can be moved or rotated in any direction as the wheels absorb each others sideways motion. 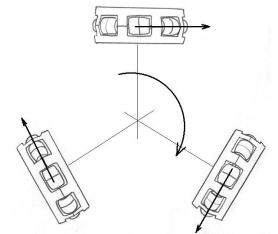 By mounting one wheel on a load cell and driving all wheels to spin the product, any error in positioning will appear as a ‘wobble’ in the detected load as the wheel with the load cell takes an increasing share of the weight as the centre of gravity moves closer to it. 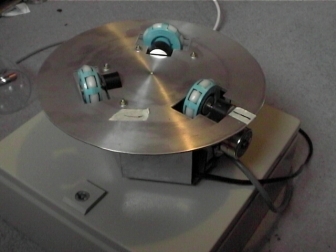 Analysis of this wobble allows calculation of the actual location of the centre of gravity, and appropriate ‘holonomic drive speeds’ for the 3 omni wheels can be calculated to re-locate the centre of gravity to the desired position.